Tape Face is one of the most unique comedians you'll ever see! He's wowed international audiences with his eccentric comedy routine. Now, this clown is bringing his dazzling stunts to Harrah's House of Tape. Are you ready for a night you won't forget? Book online to see Tape Face with his irresistible feel-good performance. See the unique comedy of Tapeface with this online discount. Save $7 per ticket. Fresh from a UK tour and hot off the stage at “America’s Got Talent,” Tape Face is now performing at the “House of Tape” at Harrahs.. Based on a legacy of mime, puppetry, silent film and magic, Tape Face evokes a warm, pensive yet humorous outlook on every object and person. With his mouth taped over, he can express his thoughts to the far reaches of the theater with just his eyes and body language. Far from silent, music is constant and is incorporated into the routine. Audience participation is part of the show and often becomes the highlight of the performance. VIP Meet and Greet packages are available and begin one hour prior to the performance. The Only SURE THING on The Strip! Now I will preface this review by stating my wife and I are huge Tape Face fans ever since his first appearance on America’s Got Talent. Once we heard is was appearing at the Flamingo Hotel in Las Vegas – we made every effort to make sure we got there to see him. We purchased the Meet and Greet package which allowed us to enter the showroom and speak with him for about 40 minutes, and as there were only about a dozen of us, it was very intimate. He was very friendly, talkative and answered all questions and told us some stories and facts about his show we would have never have know. We got a one of a kind Tape Face poker chip and a personally signed poster – and he posed with all of us individually for pictures. This was a great introduction to what was to be – a memorable show experience. As I have a background in show business, it is staggering to me the amount of behind the scenes prep work that goes into making his entire performance work. From the beginning to the end – it was 70 minutes of perfectly orchestrated lights, music and hilarious, self created skits – with running jokes and themes that run from the beginning to the end and plenty of interaction with the audience. 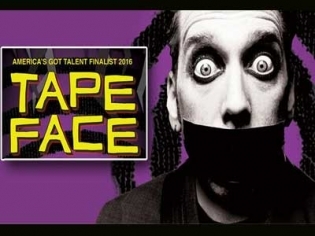 For those that wondered if Tape Face would not have enough new material to fill a full show – HAVE NO FEAR as he has included many new skits that have never been seen on social media, some of which are better that what everyone saw on America’s Got Talent and youtube, mixed in with some of his “fan favorite” skits that have become his signature. His expressions and working with the audience is truly captivating, and the resourcefulness of the props and ideas he has cultivated is nothing short of genius. It is non stop hilarity that had us rolling over with laughter the entire show. If you are a fan of what you have seen of Tape Face on TV, you HAVE TO SEE his show. It is an emotional roller coaster of crazy fun. I can say it is the most I have been entertained of any show I have seen to date and will take every opportunity to watch him perform again and again given the chance to attend. He respects and loves his audience and gives them everything he has on stage, and takes the time to pose with EVERYONE at the end for pictures, sign autographs, and share comments (though muffled through duct tape, his eyes tell every emotion – lol). In any given field you have those that rise above the rest and set a standard in excellence and innovation. In music you had Elvis, in sports it is Ali, Gretzky, Woods. One day I believe this quirky vulnerable boy with tape on his face will be remembered in the entertainment world just as those other masters have been regarded in their crafts. Tape Face is nothing short of genius!. Best show in Vegas, great venue as well.